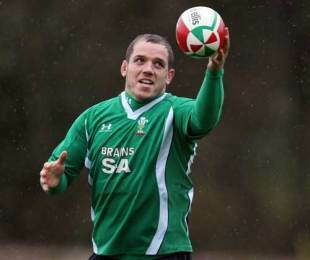 Bath have completed the signing of Wales prop Paul James. James, who has 34 caps for Wales, will link up with the Aviva Premiership club next season. James can play on both sides of the front-row, and currently plays for the Ospreys in the RaboDirect PRO12 where he has made 177 appearances for the region. Bath have just unveiled their new five-man coaching team so James will be working with former London Irish coaches Toby Booth and Neal Hatley next season. "I've been with the Opsreys since 2003 and feel that I need a new challenge to keep developing my career," James said. "Bath is a very ambitious club and I'm excited by the prospect of being a part of that. The Aviva Premiership is also one of the toughest leagues and I can't wait to get started." Bath Rugby's CEO, Nick Blofeld, added: "Paul is a very experienced prop with a lot to offer us, both in the scrum and around the field. He has a great attitude and is a tough customer who will add considerably to our team. We are very much looking forward to him joining us." The Ospreys' chief operations officer Andrew Hore paid tribute to James but also highlighted their strength in depth in the front-row. "We find ourselves particularly strong at loosehead, with the likes of fellow Wales internationals Ryan Bevington and Duncan Jones also available to us, and with some talented young props coming through below them," Hore said. "In the current climate, where we are looking to operate prudently and at a sustainable level, it makes no sense to carry three internationals in one position. "As a true Ospreylian, Paul fully understands the position and as you would expect from someone of his character, he is determined to ensure that he signs off on a positive note in the coming weeks."